Morton's Tenley Dowell approaches Metamora's Reagan Begole on the drive in Morton back on January 12th. In Monday's win over Peoria High, Dowell scored her 1,000th career point. The junior currently stands at 1,011 after the game. 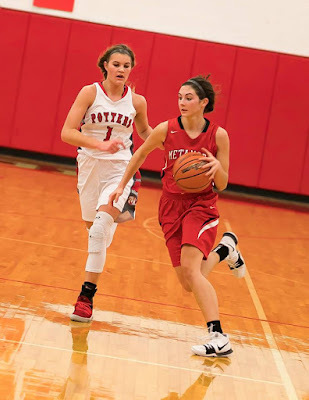 Peoria, IL - It was yet another part of the "gauntlet" as Morton Head Coach Bob Becker calls it, as the Morton Lady Potters (20-1) hit the road to take on the Peoria High Lions (16-6) Monday afternoon at the Lions Den. The Lady Potters were off and running in the first quarter. Whether it be their quickness, the smooth passes becoming quality assists, everything seemed to be clicking and Peoria High wasn't ready for it - yet. By quarter's end, Morton had held the hosts to single digits, leading 15-8 after eight minutes. The second quarter saw much of the same on both sides, as Morton would nearly have a 20-point quarter, and the Lions would muster just five points in the second. The other impressive thing from the perspective of the Lady Potters, is that they were shooting 58.3% from the field at the half, that's 14-24 to be exact. Morton used that shooting performance as well as some balanced scoring to lead Peoria High at halftime, 33-13. Josi Becker led Morton at halftime with eight points, and the balanced scoring was also paced by Becker, Courtney Jones, and Tenley Dowell, who each had six points after 16 minutes. Dowell would wind up hitting a career milestone by the end of this one. As mentioned earlier, Peoria High just didn't seem ready for Morton yet. However, they were ready for them out of the halftime locker room, outscoring the Lady Potters 38-26 in the second half. A large part of this comeback by the Lions was 5'2" sophomore guard Derria Edwards, who got a lot of praise post-game from Bob Becker. "I don't know another player that's as explosive and as quick as Derria Edwards. She can really guard." It was really a tale of two halves for both teams, but Morton found a way to survive. What hurt Peoria High in the late minutes of this one was the foul situation. They got to the point where the intentional fouls had to start flowing in, and Morton doesn't miss many free throws. In fact, they only missed three the whole game (11-14). In the end, the Lady Potters would pick up their 20th win of the year, beating Peoria High, 59-51. Coach Becker thinks the 20-point halftime lead after an "incredible" first half. Becker also said that the 20th win is somewhat of a "mini goal" for his program. It's the eighth consecutive 20-win season for Morton Girls Basketball. The last time they didn't eclipse that mark was back in 2009-2010, when they went (18-16). The 19th-year head coach is pleased with his team's progress through 21 games. "We played Metamora on Friday, two on Saturday. Eight games in two weeks. It's a chance to develop another layer of grit and toughness." Becker credited a good second half effort by Peoria High, while also talking about the things his squad needs to correct going forward. "We were exposed a little bit. Central got some big offensive rebounds down the stretch. We need to find ways to clean up those rebounds on the first miss. We turned the ball over a couple times. That's not characteristic of us." One player that made multiple contributions both in and not in the scorebook was 5'7" senior forward Caylie Jones. Jones took two charges in Monday's game to go along with eight points. Coach Becker was very satisfied with her performance. "She's (Caylie Jones) one of the very few on our that's gutsy enough to take those charges and she's good at it. Those are gritty, tough plays. I thought she had some great moments." Becker also had more praise for Central, saying that "you're not going to see too many teams play like Central". He also cited their "tremendous ball pressure" and presence in the passing lanes. In the win, Morton junior Tenley Dowell scored her 1,000th career point, which, according to Bob Becker, she's the 13th player in program history to hit the mark. Dowell had 996 points headed into Monday's game, and after a 15-point game, now stands at 1,011. Becker thought it was "awesome for her". 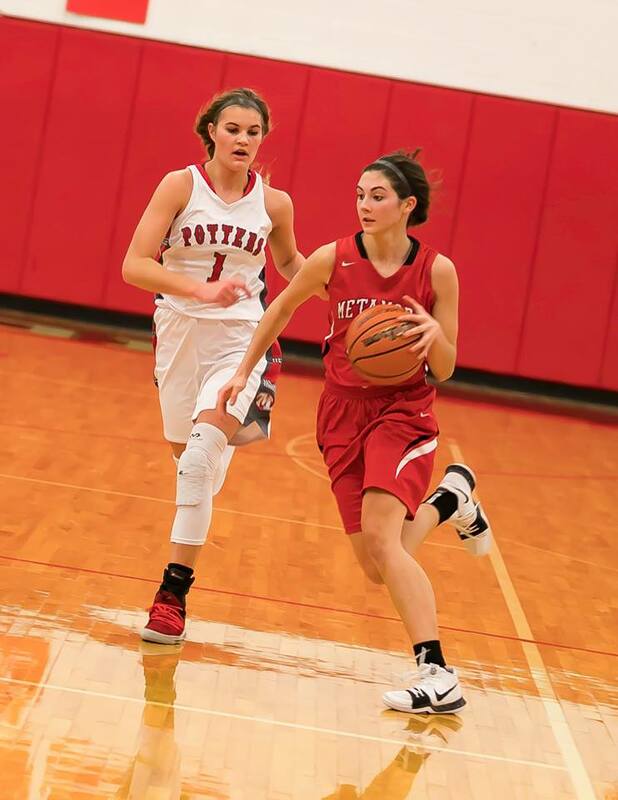 The Lady Potters will have a brief three-day break before traveling to East Peoria High School to take on the Raiders. Last time out, January 5th in Morton, the Potters won by 73, 84-11.